Recently I was able to attend another Welsh Wrestling show, this time it was their return to the Penrhiwceiber Workmen’s Hall! For those that know the venue, you know what a bizarre image you’d have picturing a wrestling ring here of all places. As I am a less than a 10 minute walk from there, I felt it was a crime not to go there to support the forever touring Welsh Wrestling promotion and show appreciation for coming to a basically middle of nowhere town in the Cynon Valleys. One disappointing thing to see was the turn out. Obviously the Workmen’s Club doesn’t offer the same capacity as somewhere like the Muni Arts Centre, but even the last show had a better showing. Last time there was even a section of seats on the stage to let more people in. This time, the curtains weren’t even open. So of course the crowd was much quieter due to there not being as many people. But the people that did show up did managed to get more into the show as the action went on. Special mention to the staff at the Workmen’s Club who were very hospitable to me. The show opened with a nice fun match featuring ‘The Model’ Jay Russo, facing off against the ever imposing but fun-loving Titan. It started oddly since Jay tried his best to act the villain, but the crowd was more inclined to cheer him at the start. Titan did his best to turn the crowd on his side as he got the kids to cheer with him when he kept asking ‘SHOULD I PUNCH HIM? !’ Eventually the crowd realised they shouldn’t cheer for someone as narcissistic as The Model as he would use dirty tricks whenever on the offensive against the larger Titan. He is an impressive talent for sure, which was shown as even some other kids cheered him on. Titan used his powerhouse offence to overpower the much smaller Russo. Well he’s not small by any means, probably one of the most physically fit people there, just smaller compared to someone the size of Titan. There was a moment where Titan gave Russo a weegie to the laughs of the kids and the grimaces of the adults seeing another man’s bare backside. Except for the women, for some reason they didn’t mind one bit. The match ended when Titan hit his finishing move, The Spear, for the pinfall victory. Starting off the show in high spirits for everyone watching. The ‘poshest man in wrestling’ Sterling Gold made his way to the ring berating everyone in the crowd, while the Amarillo loving Big Dog came out to a much happiest reception from everyone. Gold got handed the microphone before the matches started, where he made it clear that he didn’t want to be in a ‘scummy town’ like Penrhiwceiber, which everyone didn’t really appreciate. He did do a brilliant bit though where he said something along the lines of; ‘the quieter you are, the longer I show you how amazing I am!’ It definitely got the crowd going, they were really into the match. Similar to the last match, Sterling Gold used dirty tricks whenever he could to gain the advantage, whenever Big Dog had the upper hand, he would yell at all the little kids in the crowd, warning them to back off before he gives them a good hiding. Big Dog was very playful in his offence, making use of his belly and his bum whenever Gold was seated in the corner. Shades of ‘Stink Face’, I’m sure you know what I mean. Unlike the mast match though, Sterling was able to dodge a Ground Splash from Big Dog and roll him up for the pin. The crowd was definitely not happy, but Big Dog was still in good spirits as he danced along to ‘Show Me The Way To Amarillo’, which is his known theme song. If you are not familiar with it, have a listen! Grizzly Jones… I feel I know that name. Maybe from other places, definitely seems like someone who wrestles in other places. But he was here tonight and not too pleased to be wrestling in Penrhiwceiber. However the man ‘Written In The Stars’, Stevie Starr was much happier to be performing for the lovely people in Penrhiwceiber. The match was a big lads match with two powerhouses going at it. A lot more physical than I expected from this young person friendly show. They seemed to be having a bit of a personal laugh at the start, however the more Grizzly was on the losing end, the more fed up he became. His attacks being more aggressive as the match went on. Stevie was able to return favour with even bigger strikes of his own, eventually knocking Grizzly’s lights out with a ‘Superkick’ for the pinfall victory. Much like the Pontypridd show I reviewed previously (click here to read it), this one ended with all the stars who featured on the show competing in an over the top rope Battle Royal. However there was one small difference, emphasis on ‘small’, as a new challenger would enter the match! The Welsh Wrestling graduate, who had been helping out as ring crew all night, who was dubbed ‘Sparky’ entered the match as well. The whole match ended up being a good guys versus bad guys match up, it was Jay Russo, Sterling Gold and Grizzly Jones against the heroes, particularly Sparky. As the match would go on, Titan and Stevie Starr would be taken out by the dastardly trio of The Model, The Posh, and The Grizz. Grizzly Jones was eventually eliminated by Big Dog and Sparky, quickly followed by Big Dog himself by Russo and Gold. The two men then beat down on the poor lad Sparky as the crowd got behind him. Sparky used the crowd to gain momentum and eliminate Gold which resulted in an even bigger reaction from the crowd. Shortly after this, Sparky countered a manoeuvre by Russo and execute a lovely ‘Tilt-a-Whirl DDT’ on The Model, eliminating him! As you can imagine, the crowd was ecstatic that this relative unknown name managed to get an amazing moment so early in his career. Big Dog came out to celebrate with the youngster, leaving everyone happy. After the show those who bought Welsh Wrestling VIP packages got to meet all the stars of the show, all money going straight to the Kidscape charity that challenges bullying and child abuse. So yeah, another fun show. Personally it’s a bit too family friendly for my taste, but that doesn’t mean I didn’t enjoy it. The last match and that moment for Sparky put a smile on my face, as it did with everyone else in the crowd. And that’s what Welsh Wrestling is there to do for these families, to give them feel good moments and a chance to see live wrestling for a quarter of the price than you’d expect from bigger places. My only wonder is despite certain names appearing for most Welsh Wrestling shows as regular fixtures for them, it makes me want to see more of them outside of Welsh Wrestling. Big Grizzly as Grizzly Jones, James Bronco as ‘Bronco’ Brendan White, Danny Blaze is ‘Dragonheart’ Danny Jones, and many other regulars from outside Welsh Wrestling appearing as other aliases. Makes me wonder why Jay Russo, Stevie Starr or Titan don’t appear in other places. Whether it’s as different alias or their characters from Welsh Wrestling, I’m sure they would be incredibly appreciated anywhere else they competed. 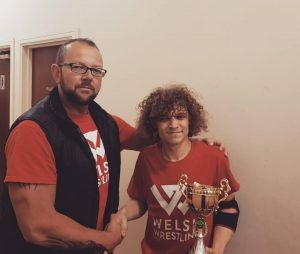 If you are someone who likes Wrestling and wants a more light-hearted evening by yourself or with your family, then consider going to a Welsh Wrestling show when they pop up the RCT area next. Penrhiwceiber? Pontypridd? Tonyrefail? Maybe other RCT towns like Aberdare? Ferndale? Mountain Ash? Porth? Treorchy? Who knows. Wherever it is next, make sure to check out Welsh Wrestling’s social media as well as Wicid & YEPS to keep up-to-date. *Images courtesy of Welsh Wrestling.